An early morning rain shower shook me awake. I got up to make sure we were still on our mooring in Esperanza, and I found three of the teens sleeping on the couch in the salon. Apparently they’d all been sleeping outside until it started raining. I started the coffee pot and went back to bed until the rain let up. Then Mary helped me round up the ingredients, and I started flipping pancakes. That was the only breakfast I made all week. I put frying pans on two different burners, so I could make two pancakes at a time instead of just one. It’s still a slow meal to churn out for eight people when you don’t have a big griddle available. After breakfast we decided to leave Batubara and Chateau du Mer behind to get an early start down the coast of Vieques because we wanted to make a stop at La Chiva to check out the beach. 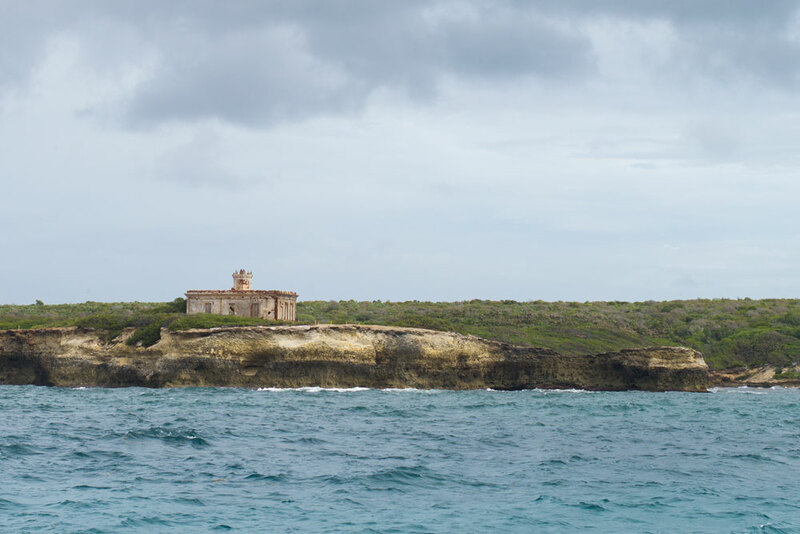 We motored east past an old deserted lighthouse sitting atop the bluff and within the hour we were anchored at La Chiva. 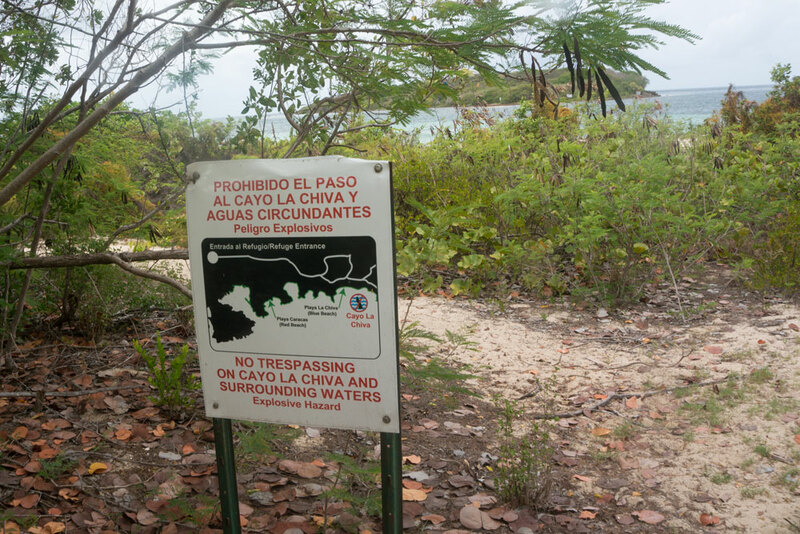 The sandy beach area was a marked contrast to Esperanza, and the first thing we noticed were the hazard markers around the small island denoting unexploded ordinance. Of course, we didn’t know what they meant at the time, but later we found a sign explaining it. 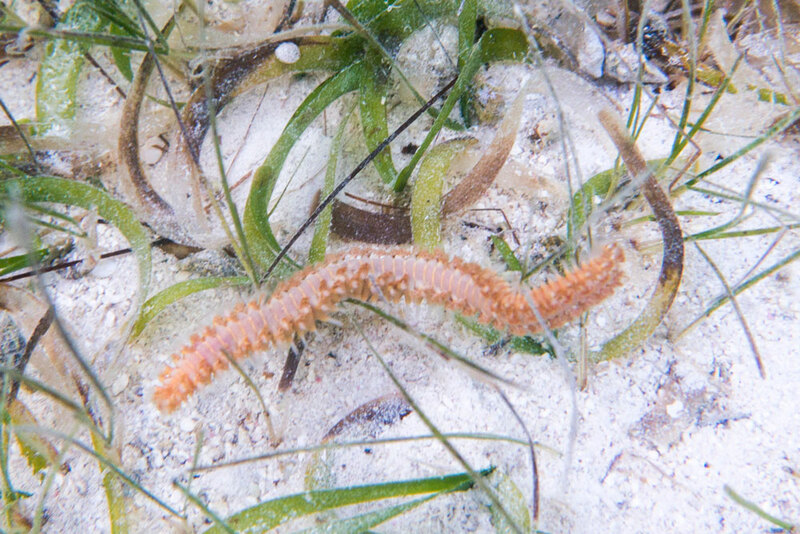 We donned our masks and fins and swam to shore, seeing nothing in the water except sand and sea grass. Then we set our flippers in a pile and took a stroll down the sand. 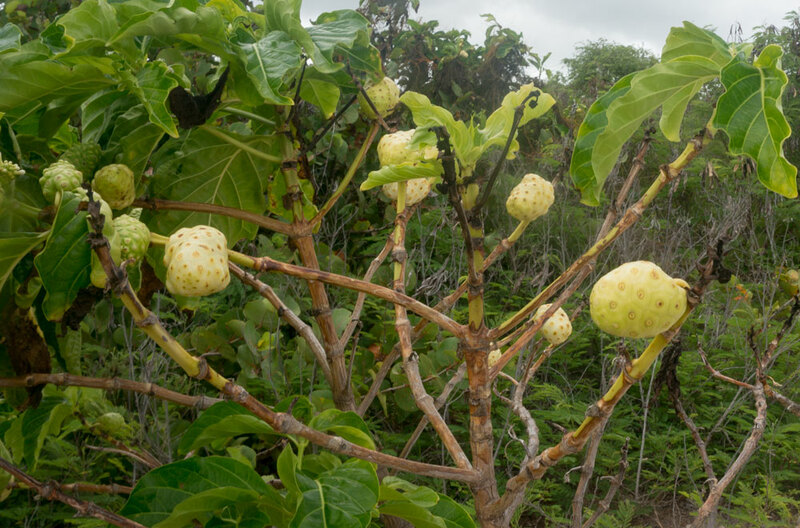 We found cactus, coconuts, and a strange bumpy fruit, which we later identified as noni, growing along the beach. 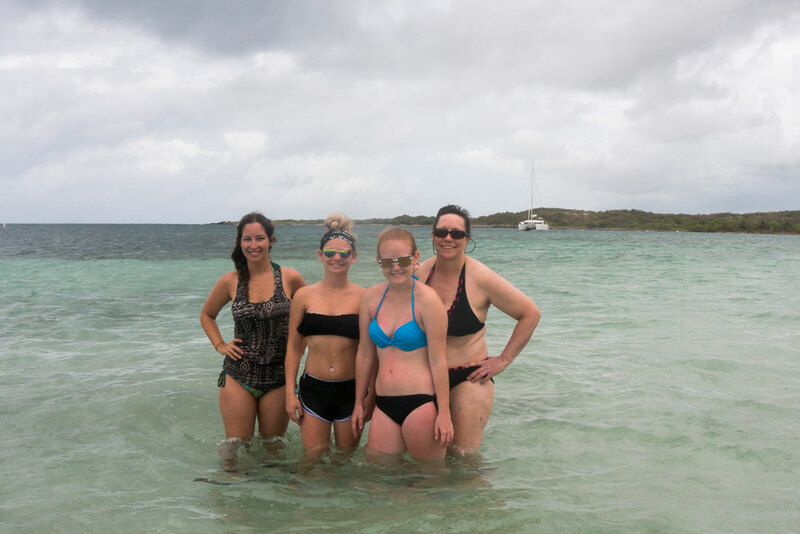 After enjoying getting our fill of beach time, I put a noni in my pocket for research purposes, and we swam back to the boat. 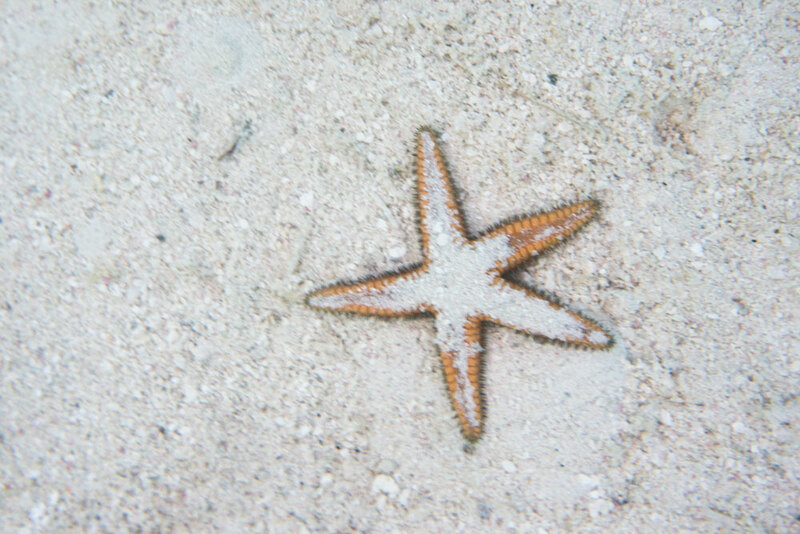 Still finding no sign of life in the water I made one more circle before giving up, and I finally ran across a big cushion sea star. I dove down to snap a picture, and then I pointed it out to the rest of our crew and the crew of Batubara who had just arrived. 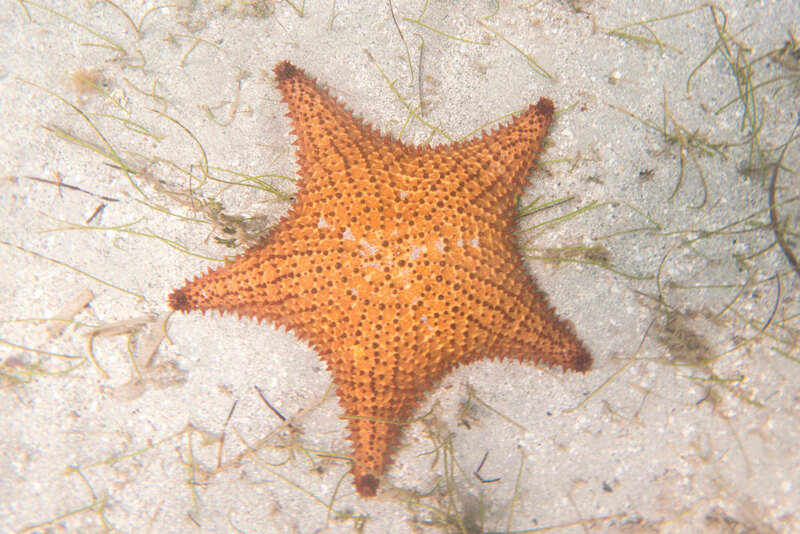 Afterwards I felt a bit guilty about it because that poor cusion sea star was molested six ways to Sunday as it was picked up and carried around to be show to everyone. However, aside from losing a sucker on somebody’s hand, it was finally released more or less unharmed. 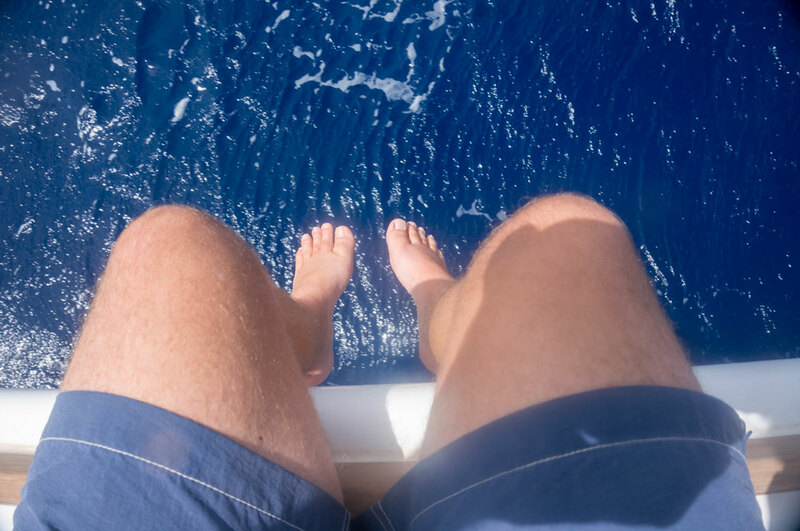 The charter company had warned us about the heavy bloom of sargassum, so while we were swimming, Andy took some time to check the starboard engine strainer and found quite a bit. However, he wanted to make sure the Starboard raw water system would prime back up before he changed the port. Meanwhile Doug tried to check the strainers on Batubara and found they weren’t very accessible and impossible to open. We all just agreed that both boats seemed to have enough water flow and decided not to mess with them anymore. 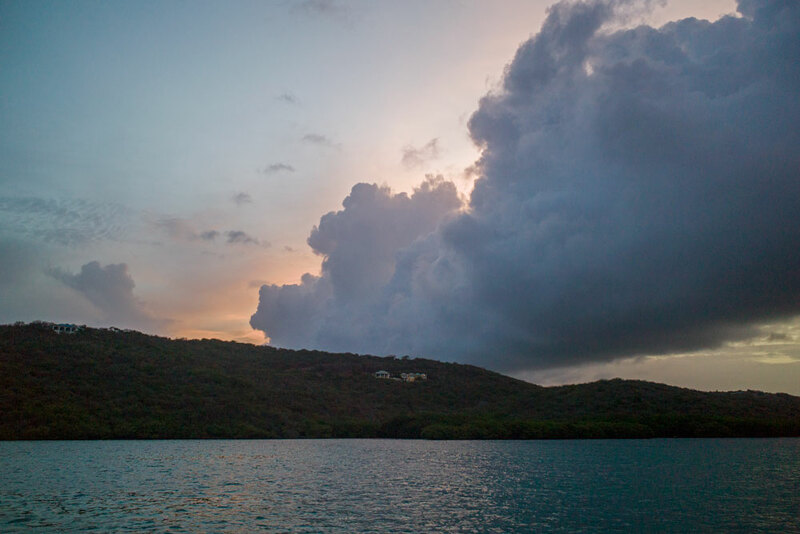 We pulled up anchor and began the longest leg of the week, the trip around the east end of vieques and north to Culebra. With gorgeous blue water ahead of us we decided to sail instead of motor and make a long tack out past the island and back. Unfortunately, as soon as we released the rolling furler, we fouled it. Jayne and Mary had to man the helm and the lines while Andy and I bounced around on the tramps trying to get things untangled. After a tense ten minutes and some good teamwork, we finally got the fouled loop off the underside of the roller and back on the drum. 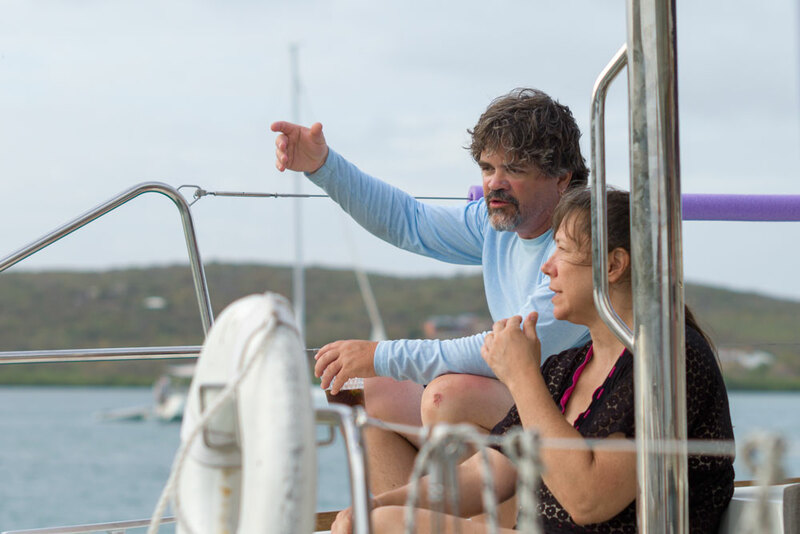 We re-grouped then set sail again, successfully this time, and wandered out into the deep waters of the Caribbean. At 40 feet, I could still see shapes on the bottom through the water. The depth finder quit at 310 feet. I sat and marveled at the blueness of the water, and I saw my first flying fish. As we neared the end of Vieques we could see the dark outline of St. Thomas on the horizon. 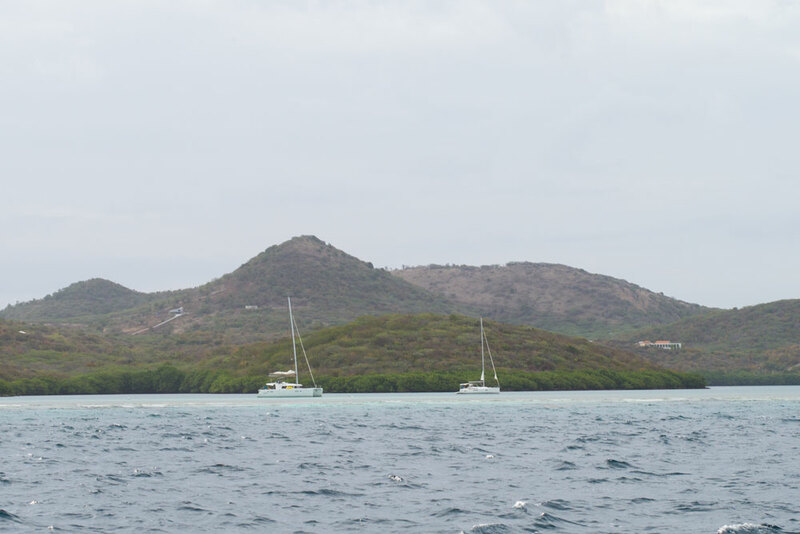 The Sail Caribe catamarans are allowed to go to St. Thomas, but the monohulls need special permission. I’m not sure exactly why, but that was the rule. However, this trip we weren’t stopping in St. Thomas. 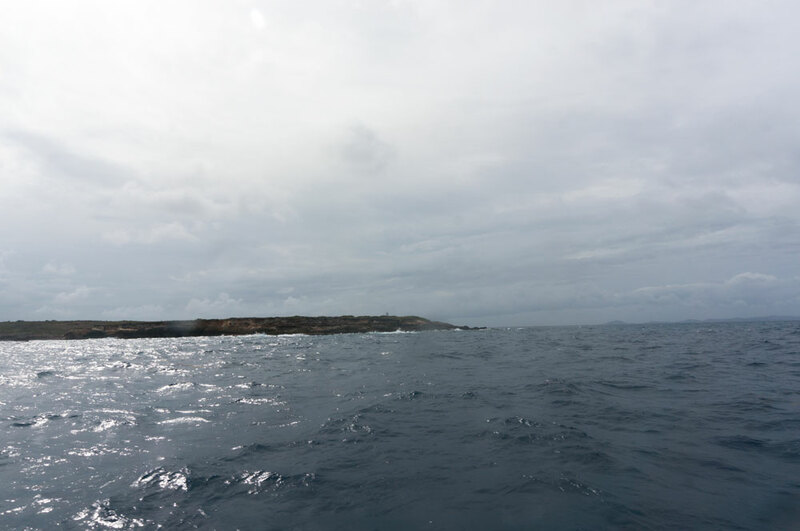 Instead we turned north towards Culebra. Since we were the only boat that took the long route by actually sailing, we were the last of our group to arrive. 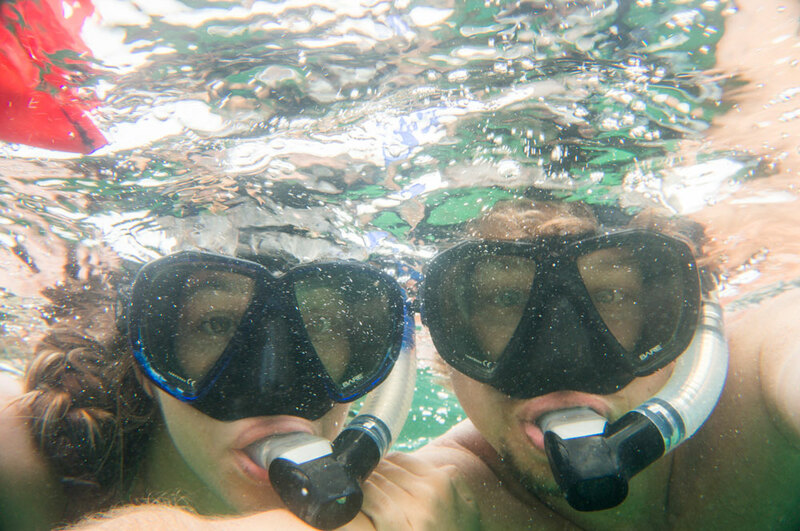 Of course, there was still time for a quick snorkel. I ran into several starfish, a giant hermit crab, and a bearded fire worm. Bahia de Almodovar is an amazing anchorage. 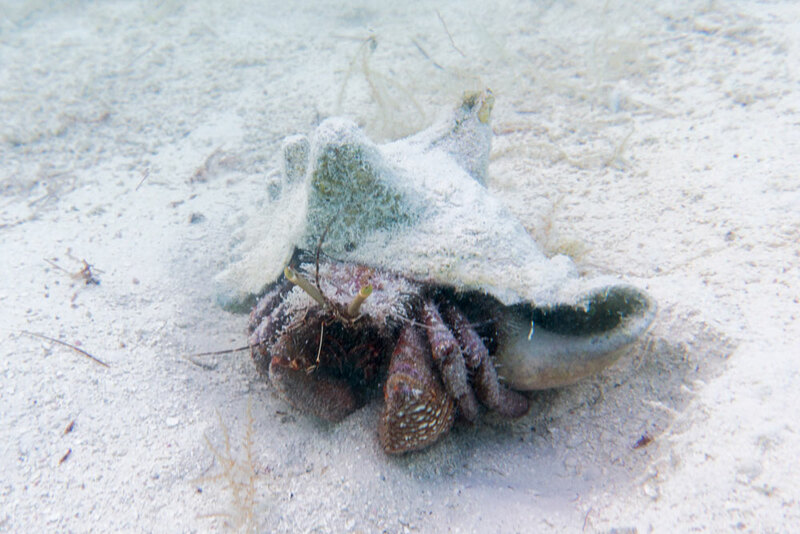 It’s protected by a reef and sandbar, so you can look directly out from your calm, protected mooring into the ocean. It was truly a beautiful spot and aside from the two sportfishers rafted on a mooring ball at the entrance, we had the entire place to ourselves. 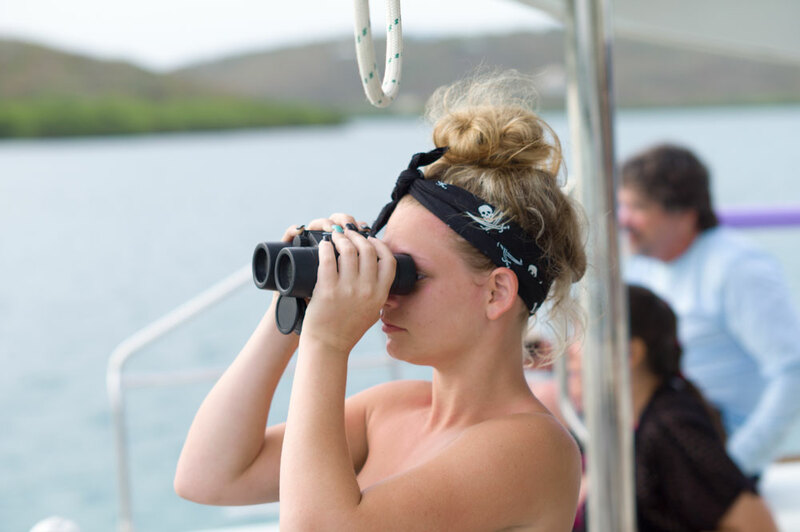 Logan, one of the teens on the boat was enjoying looking at all the homes up on the bluff around the bay — at least until she saw a homeowner staring back at her from his window. 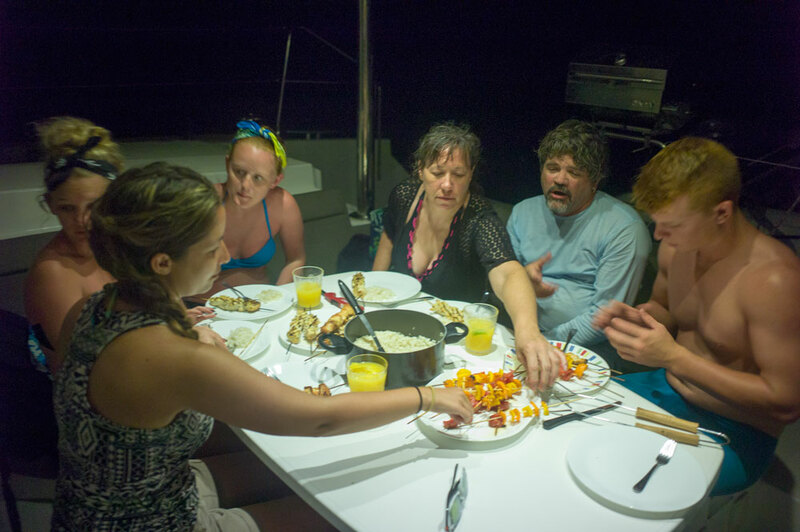 I manned the grill and we cooked Mary’s curry chicken kebabs, which got high acclaim from the entire crew. Meanwhile Cade was getting lessons in knot tying from Andy. That evening felt a bit like an article out of LIFE magazine. It was also at dinner that I filled the 32GB SD card in one of my cameras. I thought to myself, good thing I’m always prepared and bought this spare 64GB SD card. Too bad I didn’t check to see if 64GB cards worked in my older camera. Turns out, they don’t. My precision piece of German engineering was “dead in the water” so to speak. After dark we dinghied over to Batubara to watch the small sharks circling under their boat in the blue light. Those were the only sharks I saw the entire trip. When we got back to Caicu I found the air-conditioning on our side of the boat had quit, and the thermostats were giving a HI PS error. However, I was too tired to deal with it, so we opened the hatches and were thankful that there was a cool breeze coming through the bay. Thanks for all of this information. We are planning a similar trip with Batubara in October. 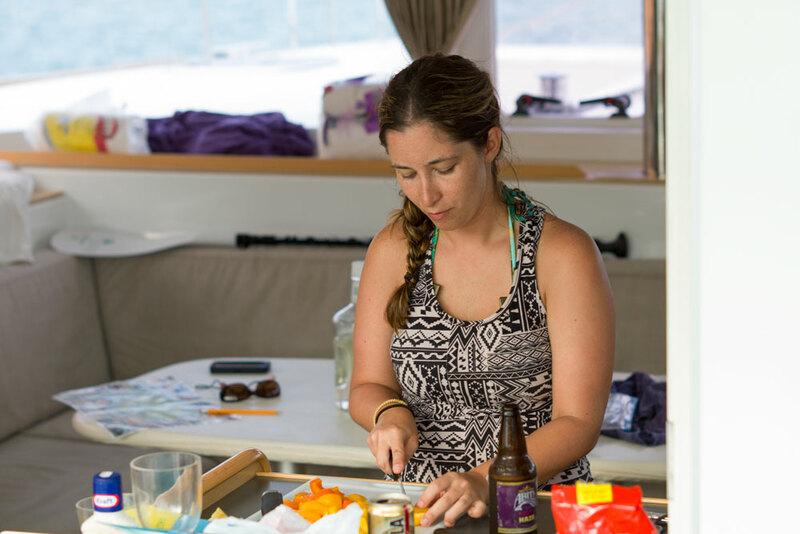 Due to timing issue with our biobay tour, we have to sail our first day straight from Fajardo to Esperanza (6 hours). We were hoping to do the rest of the recommended itinerary more or less according to Sail Caribe’s recommended itinerary, So, sail north/west back to punta arenas the following morning, then sail straight to the east/north to Culebra and do the typical clockwise island hopping (culebra-culebrita-vieques). We will lose at least half a day I guess of just pure transiting. Did you have to do excessive motoring/tacking moving from west to east on the south side of Vieques? I am wondering if us backtracking back to Punta Arenas is worth the effort, or if we should try to follow your route. None of us have enough sailing experience to go without a skipper, so I am sure he will help us decide this. I am curious to know what your experiences were though. It’s a long sail either way. Our friends on Batubara chose the motor the entire length of Vieques. We sailed southeast and then tacked back north at the end of the island. It added about an hour to our travel time. It was nowhere near as rough as the charter company made it out to be.